I am morbidly obese. I am 60 years old and weigh almost 300 lbs. That means that I am so overweight, my health is threatened by it. I am so overweight that getting around is a true struggle. I have problems with shortness of breath and walking is very far is hard for me. If I am at the grocery store, I have to sit down about every 15 or 20 minutes. I refuse to use the electronic scooters they have. For me, that would be admitting defeat. I am nowhere close to that. I am not giving up without a fight. And make no mistake about it, I am determined to resolve every anxious emotion possible to get my overweight predicament behind me for good. I am sharing my struggle because I know that I am not alone in being overweight. I know that there are millions just like me and worse. I found out in 1990 that I had a serious addiction problem as well as Clinical Depression. I was told that I was an alcoholic. I was flabbergasted. Desperate for any relief I could get my hands on, I began reading self-help books and trying to learn as much as I could about why I needed to get so drunk and engage in other risky behavior. Looking back, I see that I was trying to put the puzzle of my life together but I had no guidelines to follow. I had no effective roadmap to follow. I was adrift in an ocean of depression, poverty, overwhelming stress, addiction, alcoholism and chronic back problems. My life would be a rollercoaster for decades to come. 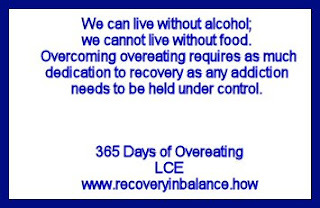 I would try to get sober numerous times only to relapse over and over again. I had problems in every area of my life. I enjoyed my jobs but I did not earn enough to live on. I selected men who were as dysfunction as I was. I had no family to turn to because I had chosen to sever ties with them. Even when I did interact with them, anything that went wrong in my life was because I was worthless and defective. Who needs to be constantly reminded of that? Almost every conversation was a fight where I had to defend myself from their attacks. That defensiveness is with me to this very day. I can still see their ugly faces twisted in anger, chewing me out time and time again. I can see both of my sisters bawling me out. I see Mother standing in the doorway of my bedroom with that thick, heavy, leather belt hanging at her side. I knew a vicious beating was next.Whatever I was in trouble about, none of it made true sense. It was decades later before I was to find out what was really going on in that atrocious, cruel upbringing I was a prisoner of. If we were out in public, I was pummelled with having to act like nothing was wrong at home. If we weren't seen as a happy family, it was my fault. As far as they were concerned, I was worthless, defective, unappreciative, over sensitive and rebellious. Nothing I did was ever good enough, so why even try? Not knowing how to solve my problems plus being overwhelmed by them, I turned to alcohol and food in a vain attempt to manage them and find relief. I did not realize then that no matter what I drank or ate would solve any of them. I had no life skills like I do now. I did not know how to problem solve, so they got worse with passing time. That kind of torment is almost impossible to get rid of. It is locked in my mind because it went on for all of the years I lived growing up under mother's roof. That monstrous influence contributed to the shoddy foundation I tried to build my life on, not realizing that I would never be able to. My behavior was padlocked into an addiction problem with a ton of self-destruction and self-loathing. When you repeatedly hear how useless you are, at some point, you begin to believe it. Now, today, I am happy and sober. This November 16, I will celebrate 10 years of sobriety. I have been working on the issues that contribute to my depression diligently and have made significant progress. My self-esteem is healing and growing stronger every day. I have finally managed to resolve and quiet the emotional chatter in my head that fueled my overeating. I live with daily flashbacks from the abuse at the hands of my family but the cravings for junk foods are gone. You are beautiful, and an inspiration. I look up to you and hope you continue to be a beacon of strength and hope to people like me. I thank you for your kind words and I promise to continue! Please, never give up searching for answers you need. You matter!